Above is the flash version of the original game which you can play right now! This classic 2D platform game looked breathtaking when it was first released for the Apple II in 1989. The rotoscopic, animated graphics were way ahead of their time and the movement of the prince was very smooth and realistic. However, the game was pretty difficult to play (maybe a bit too difficult!) and the control system was less than perfect. There were 12 levels which needed to be completed in one session , but you could save the game after reaching level 3, thankfully. There were intelligent puzzles to master along the way, and you had to contend with deathly traps (these included spikes, deep pits and guillotines) and nasty guards with swords. 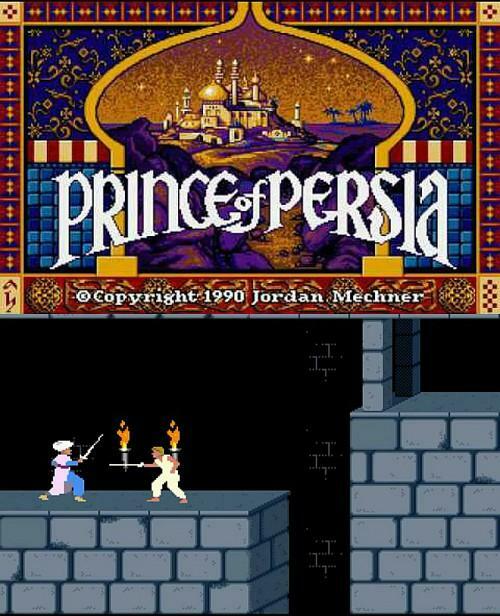 In order to fight them you needed to collect a sword early on in the game. 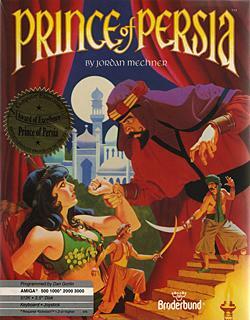 Published by Broderbund, in 1990 Prince Of Persia was ported to MS-DOS, Amiga, Atari ST, Amstrad CPC-464 and the C64. It was eventually released for all of the Sega systems such as the Megadrive, Master System and Game Gear. In fact, the game became available on just about every computer and console available at the time. A completely new 3D version of the game was released in 2008 for the Xbox 360, PlayStation 3, Windows and Mac OS X.